The Tory-led Coalition has announced its plans for funding of local government over the next 4 years. Tony Travers, LSE professor specialising in local government, described them as ‘apocalyptic’. Local government has already been in the firing line, shouldering £1.8bn of the first £6.1bn of cuts in the government’s ‘emergency’ measures announced shortly after taking office. Now, in line with Comprehensive Spending Review, total spending on local government will fall to £24.1bn in 2014/15 from £29.8bn in the last year of the Labour government. This represents a fall of 31% in real terms (using the official forecasts of 13% inflation over the years Financial Year (FY) 2010-2015 from the Office of Budget Responsibility). A comprehensive survey by the Chartered Institute of Public Finance & Accountancy prior to the latest announcement shows that councils expected cuts of 20% or more in a range of areas, from capital investment (where 44% of councils expected cuts of at least that magnitude), to both economic regeneration and community safety (28%) environmental health (14%), and despite 1.75m households on council waiting lists, housing is expected to be cut by 20% or more in some local authorities (8% of the total). There were even 3% of councils which expect children’s social care to be cut by 20% (4% of councils expecting that for adult social care). From the 40% of councils who responded to the survey, it was estimated that 73,500 jobs would be lost in the first year alone. The cuts are closely targeted at the poorest, Labour-voting areas . In the South-East, Hackney, Newham and Tower Hamlets will each experience 8.9% cuts in the next Financial Year (FY), while Essex has just 1.3% cuts. Manchester, Rochdale, Knowsley, Liverpool -St Helens, Doncaster and South Tyneside are among the 36 local authorities that take the maximum cut of 8.9%. Meanwhile Dorset gets a 0.25% increase in funding and Windsor and Maidenhead, Poole, West Sussex, Wokingham, Richmond upon Thames and Buckinghamshire all get cuts of less than 1%. But these represent only total revenue cuts. Once other income streams, such as Council Tax and other charges are taken into account the government proportion of those budgets has fallen by up to 17%, in some cases in the first year alone. In addition, it now includes a number of social care responsibilities formerly carried out by the NHS. Within local authority areas, the poor are hardest hit. Not only are they obliged to use a greater number of the services now being axed, but will also be hit by the freeze on Council Tax. The Council Tax is a moderately progressive tax, mainly due to the waivers and exemption on the very poorest. Freezing the rate while slashing services will benefit the rich at the expense of the poor. There is no accident that this ferocious attack singles out councils. In the first instance it can appear as if the cuts are not Tory cuts, as they will be carried out by a variety of political parties including Labour in office. Secondly, these councils can themselves sow confusion as to who is responsible - if they seek to justify or defend the cuts. Wherever that is the case, Labour councillors will be acting as stooges and mouthpieces for the most ferocious assault on the local welfare state since its effective establishment in 1945. The ‘localism’ of creating a dozen new Mayors is entirely fake as many will be appointed at first, and all increasingly operate under the dictat of central government. At the very least, Labour elected representatives should continually explain that the source of the cuts is the Tory-led Coalition. In addition, where they are in office, every practical step should be taken to oppose the cuts, to minimise the effects on the poor and to ensure the preservation of services, jobs and non-managerial pay. In addition, a host of revenue-raising measures can be pursued - where these have the effect of helping to reverse the government’s transfer of incomes from the poor to the rich. It is unlikely that any illegal budgets will be set. Without significant strike action by either local government workers or others, councillors can easily be picked off under current legislation. But that does not alter the obligation to work closely with local trade unions, especially as their members are often best placed to identify genuine waste and savings which harm neither services nor non-managerial jobs. Of course, all protests by either unions or local residents against the cuts should be supported. A government which claimed concessions were made to students after two militant demonstrations can be forced to make more substantial concessions by much larger, militant protest. The key to the struggle is achieving the maximum unity around opposition to all damaging cuts, to services, jobs or pay. And ensuring lasting political damage is inflicted on those responsible- the Tory-led Coalition and its policy of stealing from the poor to give to the rich- Robin Hood in reverse. There is a sharp contrast between the moderate recovery in the British economy, which is now entering its second year, and the continued contraction of the economy in ‘Northern Ireland’. Current British government policy and the entire structural relationship with Britain continue to exacerbate those negative trends. There is no timely official data for the economy in the North that corresponds with the official data for Britain. 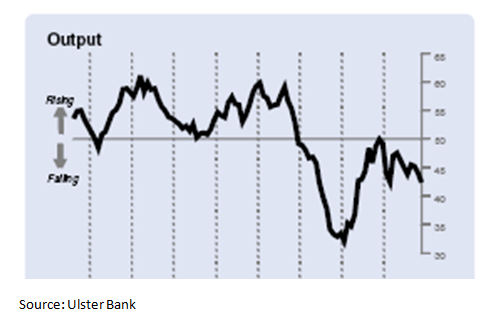 But the Ulster Bank, a division of RBS, produces monthly PMI surveys for the Northern economy . Surveys of activity by purchasing managers are an internationally reliable method of gauging activity in the private sector. The Ulster Bank output PMI in the North fell again in November 2010, at its fastest rate since April 2009. As the chart below shows, the private sector of the economy has been contracting continuously since the beginning of 2008. Surveys of new business orders and employment have fared even worse. This extended recession in the North is now 12 quarters old, compared to six quarters for the British economy. It is not only now still turning down, but has also been far more severe, as shown in Chart 2. Owen Patterson, the Tory Northern Ireland Secretary recently made the empty boast that: ‘The [government] Spending Review builds on the measures we took in May and in the Budget in June and will ensure that this country is set firmly on the path to sustainable economic recovery and financial solvency’. Whichever country he was referring to, the British colony in the North of Ireland was not one of them. With the private sector mired in a much worse recession than in Britain, the Tories’ answer is to cut government spending too. Even worse, the attack on living standards is greater than almost anywhere else. The IFS has conducted research into the ‘regional’ impact of the cuts to benefits and tax changes arising from the Labour Budget of March 2010, as well as the Tory Budget of June 2010 and the Comprehensive Spending Review. It finds only London is more badly hit than the North of Ireland. In addition, the poorest sections of the community within the North of Ireland will be hardest hit. 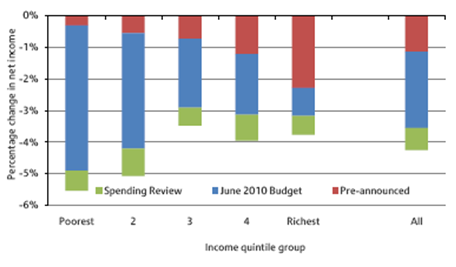 As the IFS chart below shows, the poorest are much harder hit by the policy changes than the rich. In addition, in both cases, the Institute for Fiscal Studies (IFS) does not include the impact of changes in services, which of course hit both the poor, and poorer geographical areas harder. In total the effects are much worse than these aspects of taxes and benefits highlighted by the IFS. The British government is deepening the economic crisis in the North of Ireland, and its attack is focused on the poorest sections of the population. The Scottish and Welsh Assemblies have already agreed their budgets with Westminster. This is not the case in the North of Ireland as Sinn Fein has opposed the imposition of £4bn in cuts. The Unionist parties and the SDLP were initially willing to accept the cuts. But Sinn Fein’s opposition has forced a repositioning. The campaign has focused on £18bn of investment promised for the North in the St Andrew’s Agreement, which has not been delivered. Sinn Fein has also attempted to build support directly for raising revenues to protect services and support investment, including an ongoing campaign for the repatriation of tax and spending powers which is increasingly popular and supported to some extent by Unionist parties. It is widely expected that there will be an early general election in the South of Ireland in the first few months of 2011. A key task will be pressing any new Dublin government to insist that the British government meet its £18bn investment commitments, as these were made under international Treaty obligations between two governments. Along with local revenue-raising measures, even a phased introduction of the £18bn would have a powerful antidote effect to the private sector recession and government attacks on living standards. Even so, this increased investment could do little more than off-set the cyclical effect of the recession and the government attacks. Comparative studies have shown the much lower effectiveness of investment in the North of Ireland than in the South. From the late 1980s onwards, similar levels of EU investment in both parts of Ireland have produced hugely different outcomes. This is because the North is not at all integrated into the world economy. Participation in the global economy through the international division of labour raises the effectiveness of investment. “Northern Ireland’s” status as a colony of Britain cuts it off from the rest of the world economically- exporting little and importing less. In this conjuncture, opposition to the cuts and campaigning for increased investment is entirely correct. Otherwise, the Tory-led government would be allowed to degrade the economy of the North of Ireland at a far greater rate even than in Britain. But strategically, the only route towards prosperity for the whole population of the North of Ireland is by breaking the link with Britain. The Guardian's 'Comment is Free' carries an excellent article by Neil Clark examining the connection between the privatisation of Britain's airports and the chaos at London's Heathrow and other airports faced with the bad winter weather. We reproduce extracts below and readers are urged to read the whole article. There is, however, one important point in addition to those made by Neil Clark. Airports are a classic case of privatisation of monopolies or quasi-monopolies. In most cities or regions there is only one airport, even in a very large city such as London, where there is more than one airport, Heathrow is entirely dominant, and, because of the times involved in long flights, there are for a large number of journeys no practical alternative to going by air. There is nothing whatever in economic theory that indicates that a private sector monopoly will do anything other than deliver an overpriced service - which can be either good quality service provided at an excessively high price, a low quality service delivered at an average price, or a low quality service provided at a high price. The privatisation of airports shows this reality vividly. Due to the necessary dynamics of private sector monopolies, a monopoly needs to be taken into the public sector where it can be subject to public control. Even then, of course, there will be a tough fight to deal with bureaucracy and temptations to monopolistic behaviour by the management etc but at least serious tools exist to deal with the situation via public accountability. A private sector monopoly, as Neil Clark illustrates, is merely a formula for price gouging and low quality services. A large amount of infrastructure is in the monopoly category, and that is why Neil Clark is entirely correct in showing why much infrastructure needs to be publicly owned. "... The privatisation of the state-owned British Airport Authority (BAA), we were told, would ensure that "better services are provided for all airline passengers". "I wonder if the Earl of Caithness [the Minister for Introducing the measure] (or even Margaret Thatcher herself), would have the courage to pop down to Hounslow and tell that to the tens of thousands of holidaymakers stranded at the BAA-owned Heathrow airport for the past three days. Even before this week's events, our privatised airports, with their shortage of public seating, their lack of reasonably priced food and drink outlets, and their depressing, unfriendly atmosphere, were an international disgrace. "But their spectacular failure to adequately deal with recent snowfalls has surely exposed to all but the most fanatical free marketeers, the enormous price we pay for having our infrastructure in private ownership. "Conran revealed that when he was working on the design of the state-owned Heathrow Terminal 1 and the North Terminal of Gatwick airport in the 1960s, he was pressed to make sure that he provided "lots of seating" for the public. Conran contrasted... the much more commercial attitude of BAA today, where "every square inch must be turned over to retail space". It's revealing that one major airport in Britain that does manage to keep its passengers happy is one which is in full public ownership. Manchester airport, owned by local councils, was crowned best regional UK airport earlier this year and currently holds four out of the five major travel awards in the airport industry." The Institute for Fiscal Studies (IFS) has issued a devastating critique of the Tory-dominated coalition’s decision to abolish the Education Maintenance Allowance (EMA), the grant of up to £30 per week to help 16-19 year olds from poorer families stay in further education. This decision was devised n Conservative Central Office, with David Cameron refusing to give any assurances that the EMA would be kept as far back as November. The IFS had already examined the impact of the pilot studies for the EMA, which showed a significant increase in further education participation among students from poorer families - and that the response was disproportionately higher still among women and students from black and ethnic minority communities. On average, participation rates increased from 65% to 69% of 16 year olds and from 54% to 61% for 17 year olds, the latter representing an increase of almost 13% in total participation. In terms of education quality, UCAS points increased on average by four points for all students where EMA was first piloted. This educational improvement reduces the incidence of unemployment and increases incomes over a working lifetime. SEB has previously highlighted OECD analysis which shows the very large benefits to public finances arising from higher educational attainment. The take-up of EMA has steadily risen from 430,000 in 2005 to 576,000 in 2009, by which time 67% of those surveyed said they would not have continued with their course without EMA and with 61% going on to further education because of it. In the last Financial Year the government spent £530mn on EMA. The investment returns to public finances are such that the taxes from less than 1.4% of those eligible are required to complete higher education (university or equivalent) to pay for the entire scheme. Alternatively, at current rates, all EMA recipients would need to be spared an average of less than 3 months on jobseekers’ allowance alone throughout their entire working life to pay for the scheme. Government finances also benefit from all those in between whose higher pay yields higher income and consumption taxes. Clearly, greater investment in EMA would help to reduce the deficit. This is all known to the government - much of the information is quoted from a House of Commons Briefing 1. Government policy is not about deficit-reduction at all. The reduction in education participation will hit the poor, women and black and ethnic minority communities the hardest. However, its effect will to enlarge a surplus pool of labour, forced to take lower-paid jobs. Employers will be able to access bright but untrained workers for much lower rates of pay. It is this that Marx called the ‘reserve army of labour’ whose function is to depress wages and thereby boost profits. The aim of government policy is not to restore government finances at all, but to increase the rate of profit. The mobilisation by students and their supporters in recent weeks has begun to transform the political situation in Britain. Confusion, passivity and fear are being gradually replaced with indignation, solidarity and mobilisation. In addition, the protests have begun to lay bare the actual thrust of government policy, exposing the truth behind the rhetoric of the Tory-dominated Coalition. The springboard for the Tory-led coalition attack on students and their families is the Browne Report, commissioned by the previous Labour government. Given Browne’s record at the head of BP, it is hardly surprising that the outcome should be fully of shoddy shortcuts, hugely damaging to people’s lives and to wider society. In the Foreword to his Report, Browne states that the competitive edge of the English higher education system is being challenged by other countries who are increasing their investment in Higher Education Institutions and who are educating more people to a higher standard. All this is true, as we discuss below. However, publication of the Browne Report has been the platform from which the current government has launched a policy that involves the removal of the bulk of the £3.9bn block grant for teaching in higher education. It will be replaced by a system of private funding via significantly increased fees and a marketisation of the bulk of the higher education system. All of this is cast in the framework of the ‘sustainability’ of government finances- implicitly the current or prior systems were ‘unsustainable’. The former consensus that education was a public good, providing both benefits to society as well as the individual has disintegrated under the under the acid assertion that we have no money. This is despite the fact that the budget deficit is already falling, following the modest spending measures of the 2009 Labour Budget. This is shown in Table 1 below which shows tax revenues have risen sharply in the first 7 months of the current Financial Year due economic expansion created by the last Labour government’s 2009 budget. Browne is right to raise the issue of falling competitiveness. In Marxist terms a key factor in total productivity is the skill of labour. One aggregate measure of that currently is the proportion of the population participating in higher education. In the chart below, the outcome for what the OECD designates ‘Type A’ higher education (equivalent to British university, non-vocational degrees) are shown. Britain’s position has slipped to below the average for the OECD as whole.2 Further, despite the previous government’s commitment to a 50% graduation rate, the graduation rate stagnated between 2000 and 2007. In contrast, almost a dozen other countries have seen their graduation rates rise appreciably. The debate on sources of funding and competitiveness should also be informed by the fact that the most marketised system of education exists in the United States, where stagnating graduation rates have seen it slip towards the lower end of education league tables over a 12-year period. The number of people with university degrees or other tertiary qualifications has risen on average in OECD countries by 4.5% each year between 1998 and 2006. In Ireland, Poland, Portugal, Spain, and Turkey, the increase has been 7% per year or more. Of these, Portugal has the highest contribution of private funding for tertiary education at 33%, the lowest Ireland with 15%. This compares to the US, where two-thirds of funding for higher education comes for private sources (in Britain, before the latest policy is implemented, the proportion was 36%). Browne has correctly indentified a key failing- the relative failure of British funding for higher education. But the policy adopted will only exacerbate that failing. The above facts highlight the central fallacy of a policy based on the privatisation of education spending; that the high returns to the private sector from investment in education inevitably leads to an increase in private sector investment. Much of the debate in Britain implicitly hinges on this assumption. It is certainly true that there are high returns to the individual (the private sector) from a higher education. In the OECD as a whole the private direct costs of a higher education and foregone earnings are $46,873 for a male and $45,808 for a female (2006 data, based on US$ PPPs) . The returns to the individual are on average $192,372 for a male and $137,340 for a female. These returns include higher net (after-tax) earnings as well as the monetary value of lower incidence of unemployment. The net returns are (the present value of) $145,849 for a male and $91,532 for a female. In Britain (in the same US$ PPP terms), the net returns to the individual are $207,655 for men and $152,858 for women. These gender discrepancies are themselves a function of the discrimination against women, who suffer both lower pay and are expected to act in the role of carer for both children and the elderly. The OECD does not provide, but we can be sure, that similar discrepancies exist because of the parallel discrimination against black and minority ethnic communities in relation to both pay and higher unemployment. It is for this reason that it is claimed the individual should pay more for a higher education, as they clearly benefit from it. However, the claim that the privatisation of funding for higher education will increase the rate of investment is not supported by international evidence, cited above. It also ignores other factors especially the deterrent effect of raising the cost of education. The returns are also policy driven – dependent on the government’s willingness to capture a fair proportion of those private returns through a progressive tax system. Further, a significant dent in the deficit could be achieved by a policy that would cost the government nothing- equal pay and job equality for women, and the same for black and ethnic minority communities. The government’s share of that significant increase in incomes through taxation would benefit the whole of society. But the debate has largely ignored the returns to the public sector from investment in higher education. These are just as substantial. For the OECD as a whole the average public cost of a tertiary education (male) is $32,949 and $31,830 (female) including both direct educational costs and foregone tax revenues while the student is in education. But the gross returns to the public sector, in the form of taxes, social contributions and lower unemployment benefits are $119,353 and $84,266 respectively. The net returns are $86,404 and $52,436 respectively. (The net benefits are lower than gross benefits minus costs, as the OECD applies a 5% annual interest rate discount over the period of the returns). For Britain, this net present value of investment in higher education for men is $95,318 and for women is $82,289. Put another way every £1bn invested in higher education yields £3.36bn in a return to government finances, so providing a net present return of £2.34bn. It is for this reason that the OECD headlined the publication of Education at a Glance 2010, ‘Governments should expand tertiary education to boost jobs and tax revenues .’ This may be summed up as investment, not cuts for higher education. This is shown in the chart below - where the blue line represents the public cost in investment in higher education, and the grey line the public returns. The data alongside is the net present value of that investment in US$ PPP terms. The public sector finances benefit to a very significant degree from the investment in higher education. The rate of return on that investment is a 220% for males and 252% for females. This gender disparity is accounted for by the unequal participation of men and women in the workforce as well the inequality of pay for those who do. Where the employment rate of graduate women is higher than that of men - France, Portugal and Turkey both the net and gross returns to the public sector are higher for females than for males. Therefore the public sector has a direct material interest in increasing both the employment and relative pay of women in the workforce. The same argument applies to black and ethnic minority communities- equal pay and access to jobs would lower the deficit. Increasing both access to and income equalities from higher education will also generally benefit the public sector finances. These can be achieved by increasing numbers in higher education as well as in ensuring the fully progressive nature of the taxation system. The current level of investment in Britain in education is below the OECD average of 6% of GDP. The Tory-led government’s plan is to cut education spending (current and capital budgets) from £57.1bn4 in 2009/10 to £57.3bn in 2014/155, a cut in real terms of over 12% based on their own inflation forecasts. Given rising school rolls and the aspiration of increased access to higher education, real spending per pupil will decline by at least 18%. This real cut will deepen to approximately £7bn by 2014/15. The accrued lower return to government finances based on the (probably underestimated) OECD data above will be just under £16.4bn. By the same token, increasing public sector investment in higher education will increase the public sector returns on that investment commensurately. Increased investment is an economic necessity. The OECD devotes a rising proportion of GDP to education investment, now reaching 6%. Yet British investment in education has not reached that level since a brief period in the 1970s and is now set to fall further. It is clear that there is a benefit to public finances from investment in education, just as there is a negative impact from cutting investment. The logical conclusion is therefore to increase investment to address long-term structural economic requirements but also as part of a growth-oriented programme of deficit-reduction. It should be equally clear that the Tory-led government is not focused on deficit-reduction at all. There is already talk of cutting taxes, as well as the continuation of sweetheart deals for companies like Vodafone, who can negotiate away the bulk of their true tax liabilities. Instead, education policy, is about transferring wealth from the poorest 90% to the richest 10% of society. This is fully in line with the strategic aim of this government – which is redistribution of income from the poorest sections of society to the richest sections of society from the poorest. 1. £152bn in the 12 months to October, from a peak of £160bn in March, and compared to a Treasury forecast (December Pre-Budget Report) of £178bn for the current FY, UK Treasury, public finances, 18 November 2010. 2. All OECD data from OECD, Education at a Glance. 2010 unless otherwise stated. 3. In 2007, income and social security taxes accounted for 34% of the total tax take, whereas consumption and property taxes accounted for 36%, OECD, Tax Database, http://www.oecd.org/document/60/0,3343,en_2649_34533_1942460_1_1_1_1,00.html. 4. Treasury, June 2010 Budget Redbook, Table 2.2. 5. Treasury, Comprehensive Spending Review, Tables A5 & A6. Why did China’s stimulus package succeed and those in the US fail? The difference between China and the US’s economic performance during the last three years is stark.Taking the latest available data, that for 3rd quarter 2010, US GDP was still 0.1% below its level of three years earlier. It was also 0.8% below its peak - achieved in the 4th quarter of 2007. China's GDP, in contrast, had grown by 30.3% over the three-year period to the 3rd quarter 2010. In constant price terms China added over one trillion dollars to GDP during a period when the US economy contracted. Turning to the pattern of development of GDP, the explanation of the different performance of China and the US is clear - as will be shown in Figures 1-4 below. Such difference in performance of the US and China's economies, and the differing results of their policies for dealing with the international financial crisis, are clearly of great practical, and therefore theoretical, economic importance. Taking first the US, the driving force of the Great Recession is clearly the decline in US fixed investment – as has previously been noted. Figure 1 shows that, in constant price 2005 dollar terms, by 3rd quarter 2010 US GDP was $103bn below its peak level in 4th quarter 2007. However, most components of US GDP were already above that level - net exports were up $46bn, private inventories up $103bn, and government expenditure up $131bn. Personal consumption had declined but only by a marginal $8bn. In contrast, US private fixed investment had fallen by $409bn - divided approximately evenly between a $209bn decline in non-residential investment and a $202bn fall in residential investment. In short, the fall in fixed investment accounted for the entire decline in US GDP. Indeed, the fall in US fixed investment was four times the total drop in US GDP – the increase in other components of US GDP being insufficient to offset the fixed investment decline. Figure 2 shows the corresponding changes in current dollar terms. Here, as inflation is occurring, almost all components of US GDP have increased in nominal prices since the 4th quarter of 2007. US GDP increased by $439bn, private inventories by $118bn, the net trade balance improved by $134bn, government expenditure increased by $281bn, and personal consumption by $388bn. However, US fixed investment fell by $482bn, divided into a decline of $236bn in residential investment and $246bn in non-residential investment. Turning to China, unfortunately data for the changes in the components of GDP in constant price terms is not available. However the pattern in the data available for changes in current prices terms is so clear, and occurred during a period of low inflation, that it leaves no doubt either as to the processes taking place nor to the contrast with the US. Figure 3 shows the changes in the components of China’s GDP during the critical year 2009 following the open eruption of the financial crisis with Lehman Brothers' collapse in September 2008. Figure 4 shows the changes during the overall period 2007-2009. The trend in components of GDP in China is evidently the mirror image of the US. Instead of a fall in fixed investment, Chinea's stimulus programme not only ensured there was no decline in this component of GDP but propelled a major increase in it. Taking the narrow period of 2009 alone, to minimise the statistical effects of price changes, China’s GDP rose by 3.0 trillion yuan. China's net trade surplus declined by 0.9 trillion and inventories fell by 0.2 trillion. Government consumption rose by 0.3 trillion, household consumption by 1.1 trillion, and fixed investment by 2.9 trillion. The increase in fixed investment was equivalent to 95% of the increase in GDP and the increase in household consumption equivalent to 35% - these two increases being offset by the net decline in other GDP components. Taking the period 2007-2009 as a whole, as shown in Figure 4, China’s GDP rose by 7.9 trillion yuan. Net trade worsened by 0.8 trillion. Inventories rose by 0.1 trillion, government consumption by 0.8 trillion, household consumption by 2.6 trillion, and fixed investment by 5.3 trillion – i.e. the increase in fixed investment was equivalent to 67% of the increase in GDP and the increase in household consumption to 33%. Therefore. if the Great Recession in the US was caused by a precipitate fall in fixed investment, China’s avoidance of recession, and its rapid economic growth, was driven by the rise in fixed investment. Given this contrast, the reason for the difference in performance between the US and Chinese economies during the financial crisis is evident. There is, of course, nothing mysterious regarding why China’s fixed investment increased rapidly. It was driven by a stimulus programme of both direct state investment and use of state owned banks to rapidly expand company financing. The two entirely different economic outcomes in the US and China, after more than two years of the most severe financial and economic crisis in eighty years, self-evidently have major implications for both economic practice and theory. In terms of practice, why did the US not follow China’s route, which was the most successful in any major economy, in dealing with the Great Recession? If the core of the Great Recession, not simply in the US but internationally, is a decline in fixed investment why did the US not carry out, as did China, a programme aimed against the crux of the downturn – i.e. a programme aimed at reversing the fixed investment fall? The answer lies in both ideology and economic structure. The prevailing ideology in the US is that state intervention is bad, therefore a large scale programme of state investment should not be implemented even when private investment was falling precipitately. However even if this ideology had been dispensed with, there are no structures in the US capable of delivering a large programme of state led investment. State fixed investment in the US is only 3.5% of GDP – too small a base from which to reverse the consequences of the scale of decline in private fixed investment which occurred. It is therefore clear why Hu Jintao stated that China’s high performance in the financial crisis was due to the superiority of its economic structure. China, following the commencement of its economic reform in 1978, abandoned the administered economy of the type created in the USSR. However, while the Chinese state no longer administers the economy, it has sufficient levers to control the overall macro-economic investment level. Overall investment can therefore be decelerated to slow down an overheating economy, as in 2007, or increased to stimulate investment to counter economic downturn - as in 2008. China's government policy is set not via administrative regulation but by controlling the overall macro-economic investment level. The purely private character of investment decisions in the US economy, in contrast, left it with no serious defences to confront the crisis in 2008 driven by a downturn in private investment. The US economy was therefore hampered, compared to China, by both ideology and economic structure. Whereas China was able to undertake direct state stimulation of investment, the US was forced to rely on indirect methods, budget deficits and quantitative easing, which proved ineffective in comparison. China’s economic structure therefore showed a superiority during this crisis not only to the administered economy of the USSR, which it had already demonstrated during the previous thirty years of economic reform, but to the purely private market economy of the US. In addition to the practical policy issues, considerable light is evidently cast on fundamental economic theory by analysing the dynamic of the Great Recession, China’s successful stimulus package, and the failure of the policy response in the US. Such testing and clarification of economic theory would be expected from the most severe economic crisis for eighty years. In particular, as shown above, events made clear that it was trends in fixed investment that shaped developments. This corresponds to analyses put forward not only in Keynes’s General Theory but elsewhere, but which are not central in neo-classical economic theory. It is thefore such theories and analyses centring on the determinants of investment as the critical variable in the economy which have been confirmed by the events since the beginning of the international financial crisis. Finally, the test of any theoretical position must be how fact it explains and predicts the facts of the unfolding economic process. The analysis set out in this blog over the last two years has consistently analysed developments in the US and Chinese economics in terms of the trends in fixed investment - the theoretical reasons for this framework have also been set out. This angle of approach has been confirmed in both the case of the US and that of China - as shown in the data above. Failure to analyse the core of the situation via China’s ability to raise fixed investment, and the US’s inability to do so, or even primarily concentrating on trends in consumption, in contrast led to analysis which was proved erroneous by developments both in China and the US. Michael Pettis of Beijing University, for example, stated at the outset of the financial crisis that: ''I continue to stand by my comment… that the US would be the first major economy out of the crisis and China one of the last.' In reality, as author of this blog argued, the exact opposite would occur: ‘China will be the first major economy out of the crisis and it will emerge from it before the US.’ The facts clearly confirm that China was the first economy out of the crisis, that it emerged from it before the US, and the analysis that the US would be the first major economy out of the crisis and China one of the last was in error. Stephen Roach, then Chairman of Morgan Stanley Asia, similarly focussing on consumption rather than trends in investment, argued in his book The Next Asia that it was impossible for China to achieve its 8% growth target for 2009 and that he was ceasing to be an optimist on China’s economy. This analysis was clearly not confirmed by events – China not only met but surpassed its 8% growth target and China and a number of other Asian economies have been able to far outperform developed ones. of the US consumer which has not in fact occured - as shown above. Such an analysis, therefore, did not concentrate on the key factor in the US recession, which lay in the fixed investment fall. The differences in analysis which explain the different prognoses that have been tested over the last two years clearly have continuing different practical conclusions. If the core of the problems in the US economy continues to be in fixed investment then it is unlikely purely indirect measures to influence this, such as a new round of quantitative easing (QE2) and the budget deficit, will be as effective as China's direct intervention to maintain investment. Not only has China's economy outperformed the US in the last three years but it will continue to do so - not only due to rapid growth in China but to slow growth in the US. Only if the US were to turn to a programme of direct state intervention to boost to new investment, as urged by Richard Duncan and others, would there be likely to be a short term revival and increase in investment qualitatively equivalent to that which appeared in China's stimulus package. However the strengthening of political trends such as the 'Tea Party', and the consolidation of right wing Republican control of the House of Representatives, make any such programme unlikely. The US economy will therefore continue to be hobbled, in comparison to China, by anti-statist ideology. The US economy will therefore continue to be strongly outperformed by China's and the success of China's stimulus package will stand in contrast to the failure of the measures which have been utilised to attempt to kick start the US economy. Analysis of the success of China's stimulus package, and the comparative failure of those in the US, will therefore continue to be of central importance in both practical economic policy making and discussion of economic theory. This article orginally appeared on the blog Key Trends in Globalisation. 1. Attempts to point to issues in China such as asset bubbles in property prices and inflationary pressures in food prices simplly do not quantitatively compare to the fundamental fact – the stagnation of US GDP and the thirty per cent increase in China’s GDP over a three year period. The mainstream discussion in Britain about the economic and financial crisis that has engulfed Ireland has become dominated by the question of whether British taxpayers should participate in a bailout of ‘the Irish’. Chancellor George Osborne says £8bn will be made available as part of the rescue package as it is Britain’s national interest and is ‘helping a friend in need’, while the hard Right of the Tory Party objects that cuts are being made in Britain while ‘the country pays’ to help out a member of the Eurozone. The inability of the British establishment to discuss anything to do with Ireland without parading a series of prejudices is well-known - the inability to distinguish between an interest-bearing loan and a gift a little more surprising. The real position is that the £8bn loan will certainly be at higher interest rate (5% or more) than Britain is currently paying (3% or less), consequently making a profitable return on the ‘gift’. But neither has the British Exchequer gone into the development finance business. Not a penny of the £8bn will be used to keep a single Irish worker in employment, or a school or a hospital from closing. In fact it is widely reported that the forthcoming Irish Budget, which will be a condition of the multilateral lending in which Britain is a junior participant, will include a further €8bn welfare and jobs cuts, as well as new cuts to jobs, investment and spending on essential services. The minimum wage is also likely to be cut, further compressing incomes and the total cuts over 4 years at least €15bn. Like Greece before it , the population of Ireland within the southern state will experience the true nature of the bailout; a form of international loan-sharking. The economy and government finances have spiralled downwards because huge transfers of wealth and incomes have been made to the rich, led by the banks, to soften for them the effects of the recession. These transfers were from the poor. The downward economic spiral naturally ran out of control, as incomes plummeted and new debts mounted. These were reflected in the soaring costs of government borrowing in the bond markets as investors viewed eventual default as an increasing likelihood. Now Irish taxpayers are being forced to take on even greater debts and to accept the extremes of further ‘austerity’ measures in a doomed attempt to pay for them. The Dublin government is the borrower - but the funds will be offered to existing creditors. As the Financial Times’s Martin Wolf remarked of the earlier Greek crisis, this is worse than Argentina’s debt crisis, as the creditors are being paid to escape, and there is no-one to replace them. The holders of Irish government debt are mainly Europe’s financial institutions, fund managers, banks, pension and insurance funds. As the chart below shows, about 84% of the Irish government debt is foreign-owned. In terms of recent bond issuance, this dominance of European financial institutions is if anything increased, with just 9% held in Ireland. European and British financial institutions are playing the leading role in this. In fact, the British state-owned RBS bank is the biggest single holder of Irish government bonds, owning €4.9bn of these at the end of 2009 and €53bn in total debt assets in Ireland. It is the risk of default on this asset, along with the other holdings of the British finance sector in Irish government and bank debt, which reveals what is the actual so called ‘national interest’ that moved George Osborne to use British taxpayers’ money. This is another bailout for British banks, with the government in Dublin saddling Irish taxpayers with new debts to pay for it. This process is being replicated in all the major economies across the EU. Britain and Ireland are very different countries, not least because the former occupied all or part of the latter for centuries. But one thing the London and Dublin governments share is a neo-liberal ideology learnt at the feet of Margaret Thatcher. One of the features of that ideology is a commitment to low taxes and low government spending. In reality, this is a policy which is designed to benefit capital at the expense of labour. Both Irish and British government policy is ‘reverse Robin Hood’ – take from the poor to give to the rich. Since 1992, average government revenues in the EU have been 44.8% of GDP, compared to 39.8% for Britain and 35.6% for Ireland. Consequently, Britain is also a low-spend country, where government outlays are approximately one-eight below the EU average as a proportion of GDP. 1 But the Dublin government took such a ‘low tax-low spend’ policy to an extreme. Average Irish government spending over that period was just 33.8% of GDP compared 47.5% for the Euro Area as a whole, that is nearly one-third below average. For Britain, there was also an over-reliance on tax revenues from banking and financial speculation, whereas Dublin’s tax revenues were overly reliant on property speculation. In both cases the narrowness of the tax base left the economy and government finances especially vulnerable to the Great Recession. Britain had the most severe recession of any of the large European economies, while Ireland had the most severe loss of output of any economy in the Euro Area economy. Ireland’s recession seems set to enter its fourth consecutive year in January 2011. The Dublin government has introduced five separate Budget or emergency packages, totalling €14.6bn, since the end of 2008 and now intends to repeat the onslaught over another four years. At the outset of the process that would have been equivalent to 7.7% of GDP but is now equal to 9.3% - because of the subsequent economic slump. Irish GDP numbers are themselves inflated, in part, by US multinational corporations who park sales and profits in Ireland accrued elsewhere to avail themselves of the ultra-low corporate tax rates, which at 12.5% are the lowest in the OECD. In relation to the domestic sector, which accounts for the overwhelming bulk of tax revenues, the government measures are now equivalent to 11.5% of GNP. The impact of the measures taken by the Irish government are clear, businesses reduced their investment further so that the collapse in gross fixed capital formation is equivalent to the entire decline in GDP. Consumers, frightened by job losses and suffering falling incomes, cut back on spending. As a result, taxation revenues slumped, from €48bn in 2007 to a government projection of €31bn in 2010. It is this €17bn disappearance of taxation revenues that is almost entirely responsible for a budget deficit, which is projected to be €18.7bn this year.3 Meanwhile, despite repeated and deep cuts in social welfare entitlements, as well as in all areas of government spending, the welfare bill has soared from €20.6bn in 2007 to €35.9bn under the impact of a surge in unemployment and growing poverty. In Britain, the Tory-led Coalition has set out plans that will remove £111bn annually from the economy by 2014/15 4. According to the forecasts from the Office of Budge Responsibility that would then be equivalent to 6.2% of GDP. Of course, if the British Thatcherites were to emulate their co-thinkers in Dublin, each new Budget would be greeted with expressions of disappointment that cuts had not led to savings, and the dose of cuts would be increased. Given that the budget deficit in Britain is actually falling currently, courtesy of modest Labour increased spending in the 2009 Budget, that will be difficult to justify in the immediate future. But a crucial point remains that all such ‘fiscal consolidations’ are premised on the illogical and disproven notion ‘EFC’. EFC is a mirage, the result is actually ‘Contractionary Fiscal Contraction’. That applies equally to the Tories’ savage cuts as well as all somewhat milder, slower more anguished versions of the same emanating from the Labour frontbench. Reports suggest that the Irish bailout package will be just under €100bn, so immediately doubling Ireland’s stock of outstanding national government debt. Contrary to widespread assertions, including from the Irish Finance Minister Brian Lenihan, this is not solely or even primarily a result of the extraordinary bank bailout which informed observers believe may total €76bn in losses for Irish taxpayers, as these have mostly been met already. Instead both Barclays Capital and Goldman Sachs estimate that more than two-thirds of the bailout is required to cover the public sector deficit over the next three years. It is the combination of fiscal and banking policy that has led to the bailout, and the drain from the banks could be blocked by the removal of the bank guarantee and burning the bondholders. A similar bailout has not worked for Greece. Even though no Greek government borrowing will be required from the market for three years, Greek long-term bond yields are still 12%, reflecting a growing perception that default will eventually occur. From the mildest recession in the Euro Area in 2009 (except Cyprus), the Greek economy is now in an accelerating decline with Greece's statistics agency Elstat saying the "significant reduction" in public spending had contributed to the deepening of the country's recession. The Irish bailout is widely associated with the IMF but only one-third or so of the funds is likely to come from that source. The bulk will come from the European Finance and Stability Fund (EFSF). This differs mainly in that the usual IMF package often includes some limited default or “restructuring” and losses for the bondholders in recognition of some of the losses in the market already incurred. The role of EFSF and the European Central Bank is precisely to ensure payment in full to European banks . The specific role of the IMF, representing the US, is to oppose any hike in the ultra-low corporate tax rate . The bailout of Ireland’s economy will fail. Increasing debts and reducing incomes via ‘austerity’ measures will not resolve Ireland’s debt crisis. Moody’s, one of the leading credit ratings’ agencies has already indicated that transferring more bank to the State and the lower growth outlook will lead to a downgrade of Irish government debt , implying an increased likelihood of default. This is not the end of the crisis, either for Ireland or more widely in Europe. 1. EU, Euro Area Report, Winter 2010, Statistical Annex. 2. Will It Hurt?, IMF, World Economic Outlook, October 2010, Chapter 3. 3. Dept. Of Finance, Information Note on the Economic and Budgetary Outlook, 2011-2014, November 2010. 4. UK Treasury, Comprehensive Spending Review, October 2010. SEB readers might like to read the piece here by Michael Burke, which appears on the TASC website in Ireland and argues that the Dublin government's 'National Recovery Plan' is an asset recovery plan for bondholders. Posen also highlighted key areas which would have a ‘particularly high short-term impact’- public sector job cuts, cuts to welfare spending and the VAT hike, with all of these reducing the incomes of middle-income earners and the poor- who will be forced to cut back spending. In a similar vein, the chief economist for the Chartered Institute for Personnel Development argues that not only would raising VAT hurt the same groups, but would also create an additional 200,000 job losses in retailing and related sectors, bringing the likely total job losses up to 1.6 million, not the 490,000 claimed by the Tory-led Coalition. Posen is a US academic who has closely studied the ‘lost generation’ of slow growth and recession in Japan which has been in place since 1990, warns of increased risks have of too slow growth with a negative impact on prices. He also argues that Coalition policy choices have increased those risks, whereas an increase in Capital Gains Tax would not. (In fact from the June Budget higher rate tax payers will pay just 28% on this unearned income, compared to 50% on their salaries). But in an echo of what SEB , Green and anti-poverty campaigners have called for, Posen’s boldest proposal is that the State-owned banks should not be privatised, but instead used to increase productive lending. ‘You can take the large banks in which the UK Government has a controlling stake and change their lending behaviour,’ he says. ‘....In my opinion the Government should be saying it is more important to the UK taxpayer right now that we have banks under our control providing more lending than that we maximise the privatisation proceeds in the near-term. ‘The historical record is it is penny-wise and pound-foolish to try to maximise the returns from the rapid resale of your nationalised banks. It is better to use them to help get out of the credit crisis and the recession....’. A sensible word from inside the Bank of England at last. The UK GDP data for the 3rd quarter have received more than usual attention, with many commentators claiming that the 0.8% growth rate provides room for the government’s ferocious cuts in government spending – even that they provide a justification for them. The BBC’s Stephanie Flanders leads the way, arguing not only that the data will cheer the Cabinet but that these are the strongest 3rd quarter numbers in a decade- precisely one of the lines advanced by George Osborne. If we concede that it is the BBC’s economic editor who is writing the Chancellor’s script, not the other way around, it is certainly a happy coincidence for the government to have such a like-minded and highly visible commentator. Even the Tory-supporting media were generally more circumspect than the BBC, with the exception of The Times, which declares that, ‘the deficit reduction strategy appears to be working’. Countering Nobel Laureate economist Paul Krugman’s assessment of ConDem policy that, ‘premature fiscal austerity will lead to a renewed slump’, The Times’ leader writers argue ’the evidence so far suggests that the Government’s approach is not endangering recovery’. All three propositions are entirely false. The last argument is thoroughly demolished by another Nobel Laureate Joseph Stiglitz specifically referring to Britain, where he argues that Britain cannot afford austerity and needs another stimulus package, focused on investment in education, infrastructure and technology. SEB will deal here with the first two propositions. The first estimate of GDP is an output measure, while later assessments are based on incomes and expenditures. As such, the initial estimate can be, and frequently is revised substantially. For the time being the data shows that the recovery has been in place for a year and that the economy has grown by 2.8%, only a little more than its 2.5% long term trend growth rate. This follows a 6.4% decline over six quarters, so that the economy is still nearly 10% below its pre-recession trend growth. One of the more absurd claims is that this recovery is in response to current government policy, since the first three quarters of the recovery took place before it came to office. Further, £6bn in cuts were announced in June and are only just being implemented. Yet the latest GDP data show direct government spending rising in both this quarter and in the 2nd quarter, when the economy expanded by an even stronger 1.2%. These rises in government spending represent the outcome, with a time lag, of the spending decisions of the previous Labour government in its 2009 Budget. This direct spending on government services has made a contribution to growth in both the recent quarters and cannot possibly be attributed to current government policy. But, despite some uncertainty about the data, the biggest single contribution to growth is made by the construction sector as Gavyn Davies, former global chief economist for Goldman Sachs has pointed out. Construction, together with government services comprises more than half the entire rise in GDP in the latest 2 quarters. With in construction activity, public spending accounts directly for 42% of the overall increase. Yet its impact is actually much greater, and plays a determining role in the construction sector’s contribution to growth- in what might be described as a textbook example of the leading role of the State in the whole economy. The table below shows the year-on-year growth rate of different components of construction and the source of spending. The public sector led the way in the strongest growth categories of construction (including infrastructure, where it predominates), and is actually the source of the entire rebound. Where the public sector activity was weak, in housing repair, the private sector did not supplement that weakness with anything more than reasonable strength of its own. 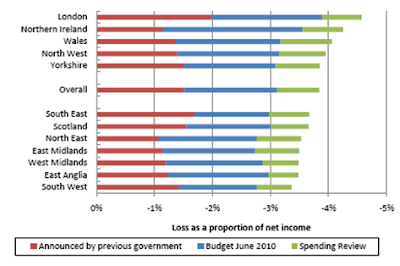 The strength of current data, which is actually modest, reflects the increased spending of the Labour government in 2009. This increased government spending is already fading away. The year-on-year growth of direct government spending, as well as in areas where it contributes to spending such as construction, is at or close to zero. New construction orders for example, fell by 13.9% in the 2nd quarter. Reflecting the disastrous impact of Alistair Darling’s March 2010 ‘worse than Thatcher’ Budget, it is public demand that has led the way, with public housing orders down a scandalous 22.7% in the 2nd quarter alone. This is before the Coalition sets to work. The table below is reproduced from the Comprehensive Spending Review (CSR) which shows the Departmental capital spending cuts. The final column shows the real terms decline after inflation, although even this is an underestimate as it comprises both a favourable inflation estimate and ignores depreciation. The roll call of savage cuts is relentless. It is this destructive force of government policy, especially as manifested by the persistence of falling incomes, job losses and long-term unemployment which will be the true measure of its effect. And, from Keynes’ dictum that ‘take care of the unemployed and the deficit will take care of itself’, there can be no confidence that the purported aim of government policy to reduce the deficit will be advanced in any significant way. The Lib Dems’ chief secretary to the Treasury Danny Alexander leaked to the press that there would be 490,000 job losses arising from the CSR. This is to manage expectations lower; the Guardian had already obtained a Treasury estimate of 500,000 to 600,000 public sector and 600,000 to 700,000 private sector job losses. This is not the same as unemployment, as there is a trend growth in the labour force of around 30,000 per month, implying that employment has to grow at that rate simply to stabilise the unemployment level. The chart below shows the total jobs in the British economy since the beginning of 1978. The first peak in employment during that period was 27.4mn jobs at the end of 1979. Thatcherism destroyed 2 million jobs by the beginning of 1993 and the previous peak level in jobs was not recovered until the end of 1987, 8 years later. Meanwhile, the workforce had grown by a further 2million, leading to mass long-term unemployment which hit youth, women and black and other ethnic minority communities especially hard. A new peak in employment was reached in mid-1990, at 29.2mn jobs. But 1.8 million jobs were lost over the next 3 years, so that by mid-1993 there were actually 30,000 fewer jobs than the total Margaret Thatcher had inherited in 1979. This new peak of 29.2mn jobs was not recovered until the 2nd half of 1999. The most recent recession began in 2008 and in terms of severity was almost as great as the 1980 and 1990 recessions combined - output fell by 6.4% compared to a combined decline of 7.1%. However, the total decline in jobs was 1.05mn. This is very severe loss of jobs, but not on the same scale as the total of 3.8mn lost jobs in the 1980s and 1990s. In the most recent quarter there were a net 71,000 jobs created, although these were overwhelmingly part-time jobs. As shown in the chart below total hours worked (a measure which removes all the distortions by shifts between full-time and part-time work, as well as those introduced by repeated changes to the unemployment register) grew by 2% in the latest 2 quarters. It is absurd of the Government Ministers and their supporters to claim credit for a job rise that took place even before they took office. Their handiwork will only become apparent in employment totals next year. In fact, given that the employment decline has already halted, there will be no-one to blame for the destruction in jobs next year except this government.